Happy 50th Birthday Lorie and PKS Trendspotting Project!! Hi everyone!! So much going on today!! First it's Lorie Souther's 50th Birthday and we are celebrating with a hop! Happy Birthday Lorie, I hope your day is full of joy and happiness!! 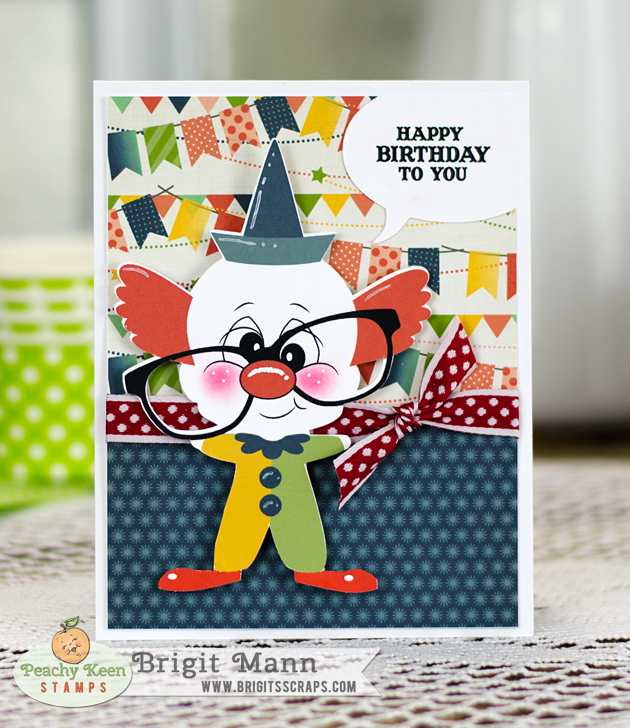 I used the Clowning Around Face Assortment set and a sentiment from the PKSC-30 June 2014 set. Hope on over to Viv's Blog and see her Happy Birthday card to Lorie!! 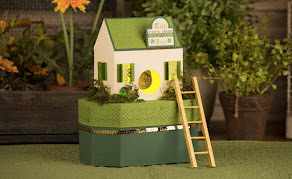 Today is also my PKS Trendspotting day and I have a quick project to share. 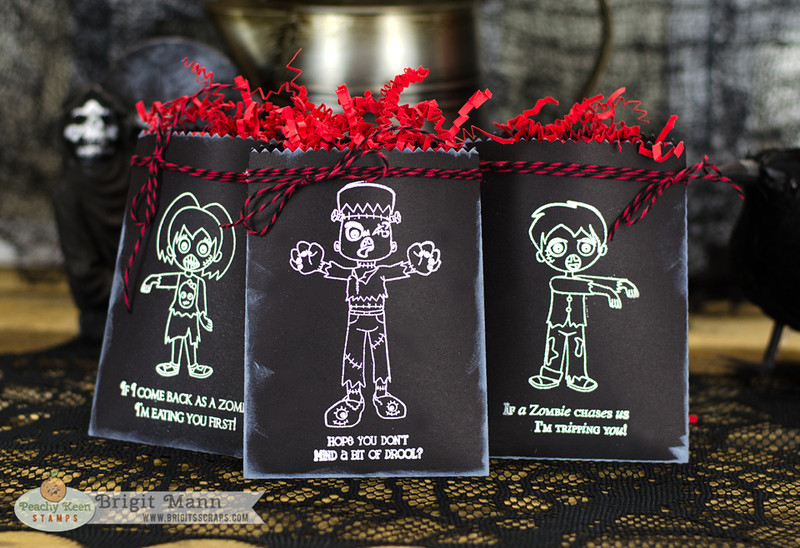 These Halloween treat bags were totally inspired from the photo below, hop on over to the pks blog for more info on these quick and simple bags. 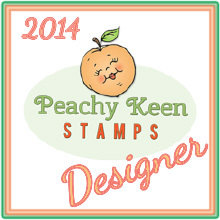 Peachy Keen Stamps August 2014 Release and Reveal Blog Hop! Glad you could join us for our Peachy Keen Stamps August Release Blog Hop!! if not hop on over to the PKS Blog! I have a card to share using the K-1420 Trio of Girl Ghosts and sentiment. Aren't these little ghost so adorable, I love them!! Don't forget about the Prizes! Stamp sets that are showcased each day, one winner who comments throughout the blogs who are featuring designs on that day. GRAND PRIZE $50 Gift Certificate to Peachy Keen Stamps. All winners will be announced at the conclusion of the hop. We'll leave the hop open for commenting through Thursday at Midnight and a winner will be announced in the PK Round-Up on Friday. 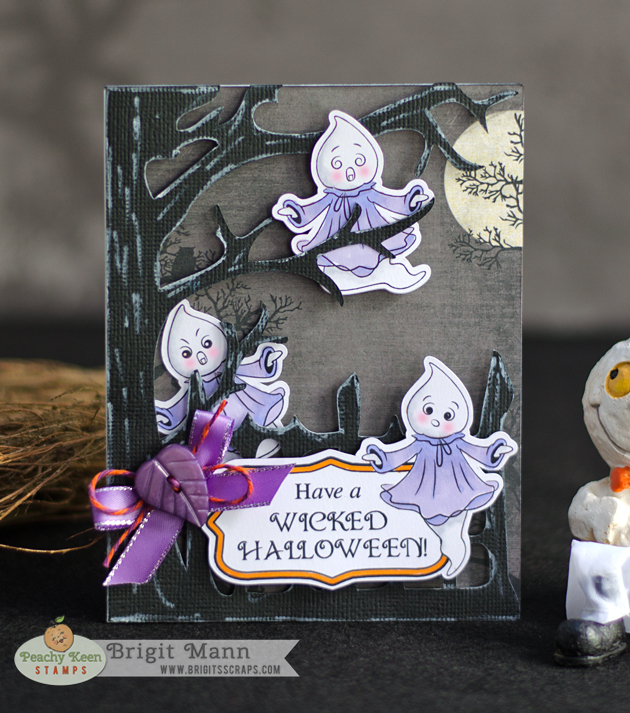 Now hop on over to Jessica's Blog and see what Spooky goodness she has created for us! Would you like to have these adorable stamps arrive at your door automatically, with that some awesome perks that include a FABULOUS monthly discount on any other items you’d like to order? If your answer is yes to any of those questions, then please follow this link to find out more about our monthly stamp club, and if you have any additional questions, feel free to email us info at peachykeenstamps dot com. 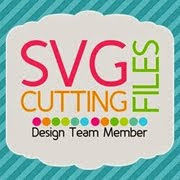 We’ll be happy to help and get you set up as a club member! 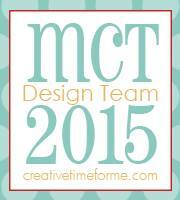 Thanks for joining us for our July event, and be looking for our July Linky Party to open soon! We want to see what YOU create with these new stamps and each creation you share gets you a chance to win a great prize!! Oh, and don’t forget about our challenges! You’ll find links to both the Linky Party and Challenges on the PKS sidebar. Hello again welcome to Day 2 of Peachy Keen Stamps August Sneak Peeks! Tonight we bring you some more fabulous creations from our Design Team using PK-1417 Faceless Zombie Kids #1, PK-1418 Faceless Zombie Kids #2, PK-1415 Zombie Face Assortment, PK-1423 Sentiments and Label, PK-1414 Happy Halloween Background and PK-1422 Poseable Skeleton. 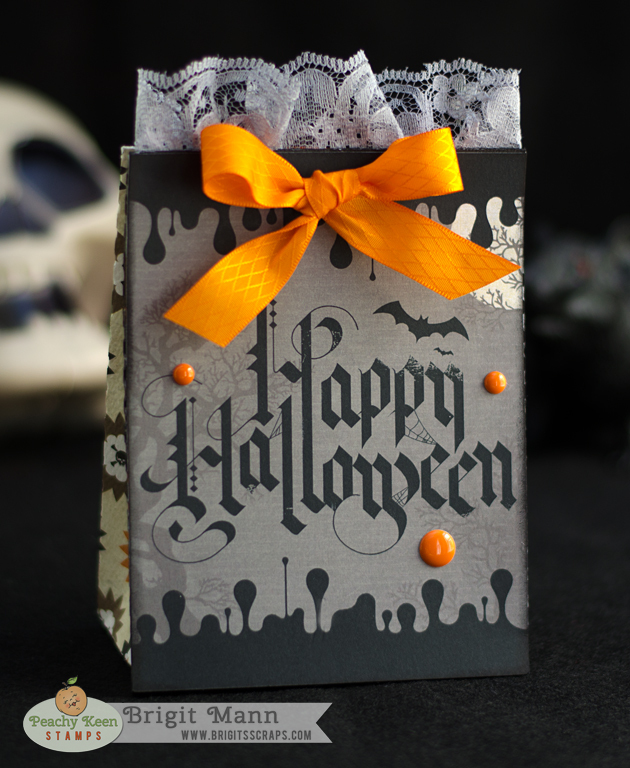 I made a spooky treat bag using the Happy Halloween Background Stamp! If you're a Stamp of the Month Club Member then you've already received your sneak peek of the August stamp set via email, and now you can see just how wonderfully that set will go with the rest of this release. If you're not a club member but would like more information about how you can become a member as well as the perks that go along with membership, just click on the following link. Membership DOES have some SUH-WEET benefits!! If you LOVE to be inspired and share your work using Peachy Keen Stamps, then you should really consider joining us in our special Facebook Group. The Peachy Place is where we gather, chat and share and we'd love to have you join us!! Just hop on over there and ask to join the fun!! PRIZES: stamp sets that are showcased each day, one winner who comments throughout the blogs who are featuring designs on that day. GRAND PRIZE $50 Gift Certificate to Peachy Keen Stamps. All winners will be announced at the conclusion of the hop. We'll leave the hop open for commenting through Thursday at Midnight and a winner will be announced in the PK Round-Up on Friday. Thanks for stopping by tonight! We'll see you tomorrow... same time... same place for our BLOG HOP, we'll have more SPOOKY SWEET August Release treats for you!! 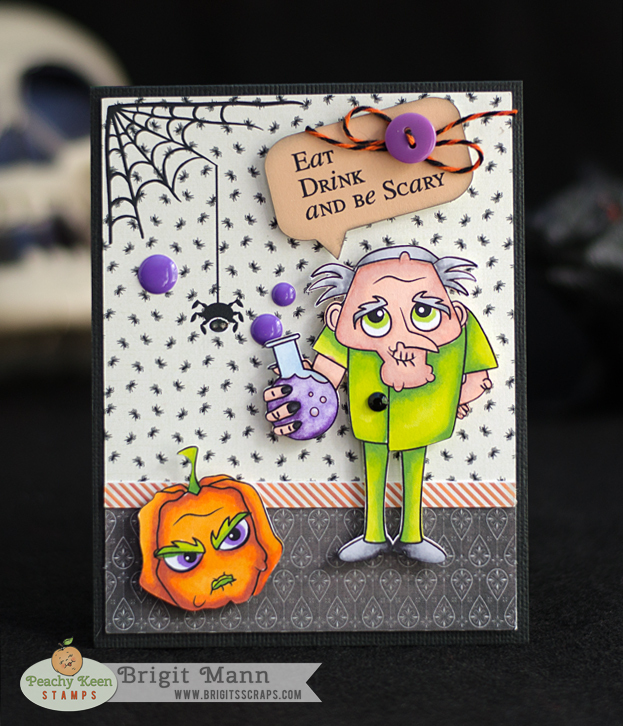 Are you ready for a new Peachy Keen Stamps release that's overflowing with Halloween fun? We've got it for you and it's filled with wonderful new images and sentiments that are spooky sweet and guaranteed to tickle your funny bone! Tonight we bring you some fabulous creations from our Design Team using PKSC-32 August 2014 Stamp of the Month, PK-1419 Cranky Franky, PK-1420 Trio of Girl Ghosts, PK-1421 Ye Olde Bone Yard, and PK-1422 Poseable Skeleton. Thanks for stopping by tonight! We'll see you tomorrow night... same time... same place for MORE great peeks of our SPOOKY SWEET August Release! !